Since we first planned it, I have always thought of this issue’s theme as environmentalist. “I live here”: this is my planet, my legacy, my context, resources, responsibility. But one of the advantages of gestating a literary magazine is that it is a long process, occasionally unpredictable, and totally subject to mutability. Mutability in the course of a magazine’s making is generally a matter of which stories and poems we select to fill it, what texture of their own each piece brings to the theme, and how the stories and poems speak to each other and echo, to create a galaxy all of their own. It’s a beautiful process that we revel in, each time around, as each new theme takes form. This issue, more than any before it, has also been subject to outside influences. 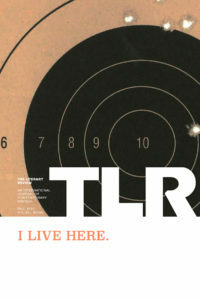 Over the past year, I found it harder and harder to think of “I live here” as dissociated from “stand your ground.” The question of territory—over land, one’s body, one’s privacy—started to feel argumentative rather than metaphysical. One week, “I live here” means “I live here, too.” Another week, it means “get off my property.” Last week it meant “save the whales.” This week it means “climate change threatens all of us.” In the last month before we went to production, we had an astonishing presidential election, from which we learned vividly that we live in a divided country. It is perhaps that very deep sense of division that leads me to think “I Live Here” is a theme about diametric opposition and its disruptions. It’s about the way two people can say the same thing, mean exactly the same thing, but also have completely different understandings of the implications and the consequences. My friend Jennifer, whose target practice graces the cover of this issue, has a creative, thoughtful, nuanced and uncompromising mind. She’s one of the last people I might imagine heading off to a gun range to see what she can shoot; and yet I wasn’t in the least bit surprised or taken aback to find that she’d headed off to a gun range to see what she could shoot. To my mind, that’s what literature does, or can do—upend expectations without looking over its shoulder. It messes with a world of diametric oppositions, either or, this side or that side. Literature, our art form, introduces nuance and thoughfulness in an uncompromising way. It makes our galaxy bigger. This art is politics, activism, environmentalism. For the moment, it must be. Because a world of black or white is not only colorless, it’s anarchy.